Somewhere in the Universe a star or stellar remnant is preparing to explode. Binary white dwarf systems can build up in mass as the compact object accretes mass from its companion. Eventually, the tiny ball of matter will explode in a brilliant event known as a supernova. The blast can glow for weeks or even months before eventually fading. However, the shock wave from the event will travel through the surrounding medium, energizing the gas and forming a brilliant remnant. This supernova echo can last for hundreds or thousands of years before fading into the background of the cosmos. But how can these remnants persist for so long? While the initial shock wave does the work of powering the remnant, astronomers have suspected reverse shocks will eventually race back to the center of the supernova, reigniting the particles. 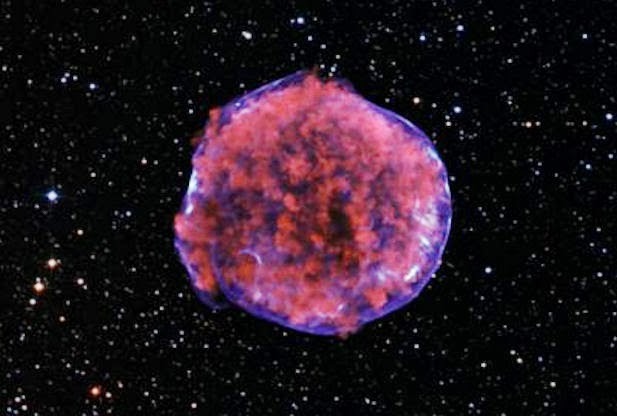 Now, new work on the Tycho supernova remnant – so named for the famed astronomer Tycho Brahe who tracked the evolution of this system in the sky in 1572 – has measured a reverse shock penetrating the remnant at more than 1,000 times the speed of sound in the gas. This is more than three times the speed of the outward shock, which is still pushing out into the surrounding interstellar space. “We wouldn’t be able to study ancient supernova remnants without a reverse shock to light them up,” says Hiroya Yamaguchi, who conducted this research at the Harvard-Smithsonian Center for Astrophysics (CfA). Because the outward shock expands so violently through the gas, there is a significant “backwash” that rushes back to the center of the supernova. “It’s like the wave of brake lights that marches up a line of traffic after a fender-bender on a busy highway,” explains CfA co-author Randall Smith. This is significant because of the reverse shock were to cease, or not arise in the first place, the inner volume of the remnant would fade much more quickly a phenomenon that has been observed in other systems. “Thanks to the reverse shock, Tycho’s supernova keeps on giving,” says Smith. Now that such a high speed shock has been observed in the Tycho system, the team will turn the Suzaku X-ray spacecraft the primary instrument used in this work to study other young supernovae systems in the hope of finding more reverse shock powered remnants. This is important because there are still significant questions to answer. While the shocks are clearly powering the supernova remnant by rapidly heating the electrons, the process by which the energy is transferred to the particles is still unclear. Hopefully more time and data will bring the answer to light.